Free Shipping Included! Vonets VM300 mini wifi module wifi bridge/repeater/router for DIY professional lower power with,300Mbps stablest wireless module/signal booster/extender/amplifier by Vonets at Pacs BG. MPN: VM300. Hurry! Limited time offer. Offer valid only while supplies last. Hardware Features: 1. Clocked of main chip：580MHz 3. Support 1-14WiFichannels. 4. Rated Power< 3W. 5. Output power of Module RF :13.5dbm--14.5dbm. 5. Output power of Module RF :13.5dbm--14.5dbm. 1. Independent hardware data processing, does not consume host system resources, without installing any drivers. 2. Built-in WEB configuration services, available configure module parameters through the web. 4. Support VDNS technology, in bridge mode, can be configured via logging on the domain login page, solve the problem that configure and secondary development. 5. Two external antenna RF Female. 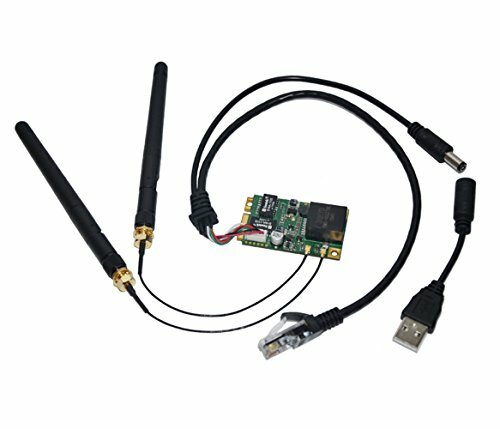 WiFi working frequency:2.4GHz,2T2R dual antenna,300Mbps. Support intelligent transparent bridge mode, also can be an AP Client or AP Station. Two software-controllable operating modes:router mode,Bridge+Repeater mode. Independent hardware data processing, doesn't consume host system resources, without installing any drivers. Adopt the original creation D/A temperature compensated auto frequency control technology（TAFC）,make sure the lasting stability to ensure that the WiFi signal is not dropped. Manufacturer: Shenzhen HouTian Network Communication Technology Co., Ltd. Publisher: Shenzhen HouTian Network Communication Technology Co., Ltd. Studio: Shenzhen HouTian Network Communication Technology Co., Ltd.